The only turtle species to breed and nest in Galapagos and a frequent sighting on snorkels and boat trips around the Archipelago. 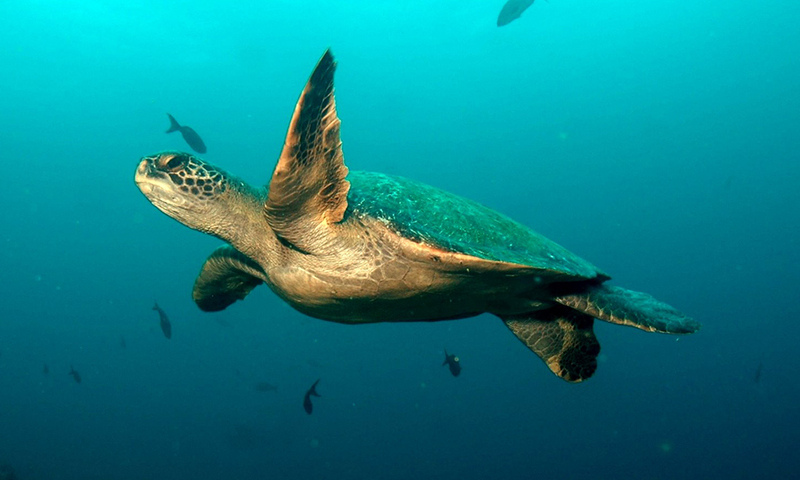 The Galapagos green turtle is only commonly seen in a few places in the world, including Galapagos. 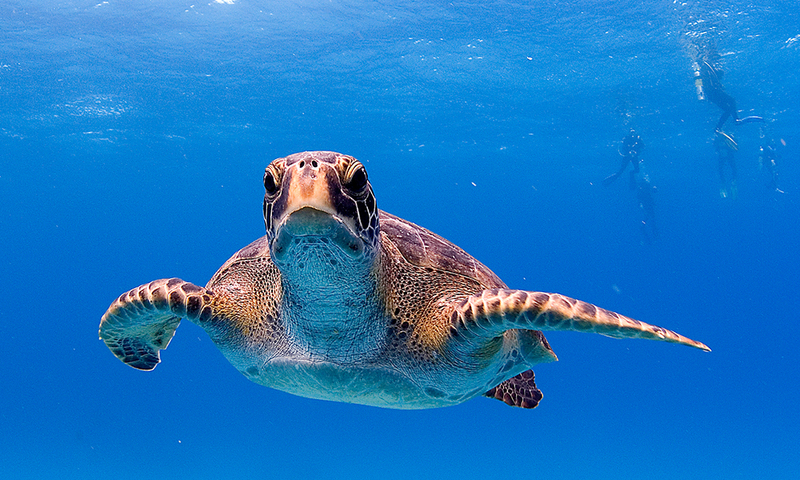 They are the only species of sea turtle to nest in Galapagos, with some females returning several times to lay their eggs, and are also the most common species sighted. They live in the tropical and sub-tropical waters around the Pacific islands, differing from other marine turtles by their serrated lower jaw and a single pair of scales covering their eyes. Adults are primarily vegetarians whilst juveniles are more opportunistic, eating almost anything. Mating typically occurs in summer during the warmer months. Females will lay their eggs at night after crawling up the beach past the high tide mark and digging a nest with their back flippers. The female will then lay between 50 and 200 eggs before making her way back down to the ocean before the sun rises. These eggs are incubated in the tropical heat for 45-55 days. As with many reptiles, the gender of the hatchlings depends on the temperature the eggs are kept (females occurring at hotter temperatures). The eggs in a clutch will typically hatch at the same time to ensure more chance of individuals surviving the death race down the beach. Cormorants, albatrosses, gulls, frigatebirds, crabs, hawks and countless other predators wait for the hatchlings and consume most before they even reach the sea. Even in the water they aren’t safe, with sharks and frigatebirds preying on them. For the few who are successful, their life is only just beginning and they face a battle to survive and grow until between 26 and 40 years old when they become mature. As with all turtles, Galapagos green turtles have an ingenious way to clean their bodies of salts; they are able to cry the excess salt in ‘tears’ from special glands underneath their eyes to keep a stable inner environment. They are fast swimmers, travelling at speeds up to 35 mph over long distances. They are even able to sleep underwater, but only for a few hours at a time. Stress affects the time they can spend underwater, so when fleeing a predator they can only stay submerged for a shorter period of time. This also explains why turtles drown relatively quickly when they are caught in fishing nets. Where to see them: They can be seen in coastal waters throughout the Archipelago. When to see them: They can be seen throughout the year in Galapagos. December to March is when pregnant females may be seen around the shores awaiting for night to lay their eggs. Threats: The adults are targeted by fisheries globally for their shells, cartilage and meat. Bycatch of turtles is a huge problem as once they become entangled in nets and gear, they are likely to drown before they are landed. There is also some evidence that turtles can get the ‘bends’ when brought up quickly in fishing gear. Habitat degradation and disease are major factors in the decline of this species, as well as light pollution which fatally attracts hatchlings away from the sea towards human settlements. 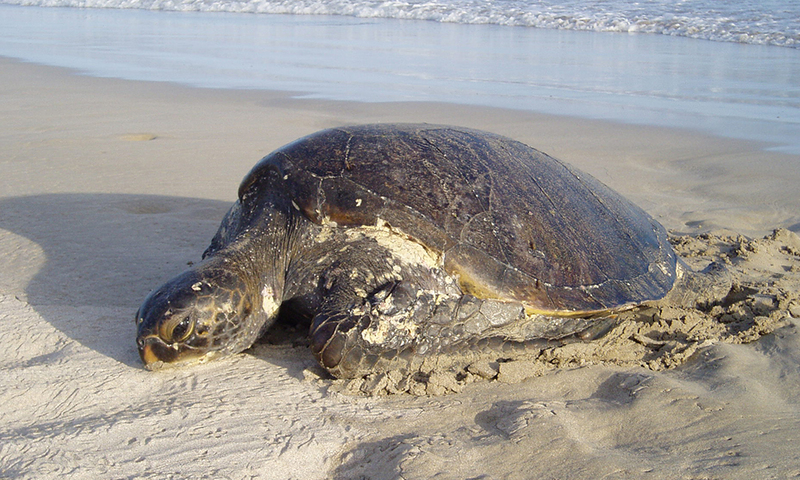 Degradation of foraging marine habitats shown by the increase of fibropapillomas (fibrous tumours that inhibit movement or eyesight of turtles) is also a major cause of mortality. In addition, they have been found entangled by and ingesting marine plastic pollution which could be posing a threat to their survival. Conservation action: The trade of Galapagos green turtle parts has been outlawed on the market meaning their trade has dropped dramatically. It appears on Appendix I of CITES and is therefore illegal to trade in wild-caught specimens. They are protected from fishing by the Galapagos National Park. Currently, we are working with partners to assess the risk of marine plastic pollution to Galapagos green turtle as part of our Plastic Pollution Free Galapagos programme. 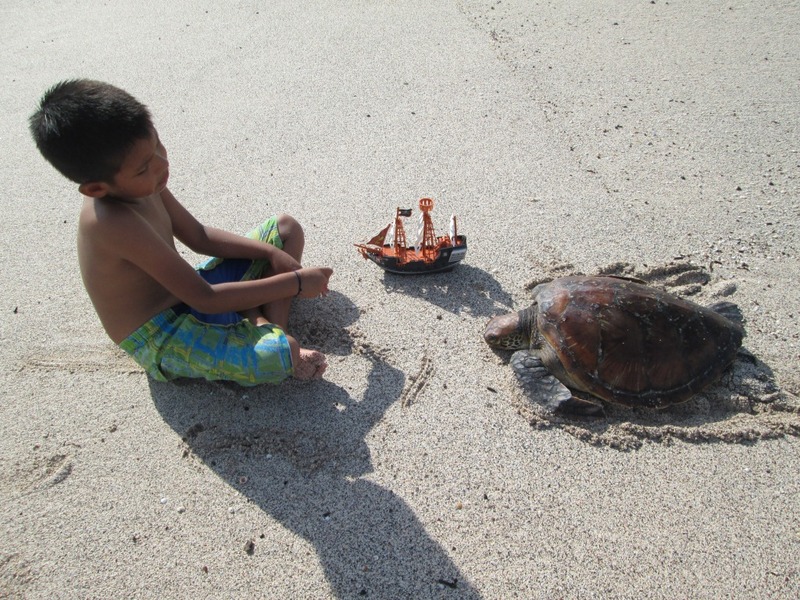 Help us to protect Galapagos green turtle today by donating to our Plastic Pollution Free Galapagos programme!